As he takes over a newsroom that was just reduced by half, the New York Daily News' new top editor, Robert York, is asking his embattled staff for time to chart a new course. Addressing the newspaper's employees for the first time on Tuesday, York asked those remaining in the newsroom to stay at the Daily News for 30 days to give him time to demonstrate that he is taking the publication in the right direction, according to a staff member who was present. But York heard complaints that the Daily News sports department had been gutted by Monday's layoffs, as well as open confusion over the long-term strategy of the tabloid's parent company, Tronc. The source said that York spent much of the meeting saying he might end up rebuilding and reorienting existing talent to cover the parts of the paper that have been eviscerated by the layoffs. The hastily arranged meeting served as York's introduction to a Daily News staff still reeling from Tronc's announcement on Monday that the editorial team has been reduced by 50%. Joining York in leading the hour-long meeting was Tronc executive vice president and general manager, Grant Whitmore. They both encountered anger and frustration when they addressed the Daily News staff on Tuesday, according to an employee who was there. The source said that many employees were upset, and that there was "widespread confusion about why the layoffs happened before a strategic plan was developed." At one point, Whitmore was asked why a strategy wasn't developed before the reductions were made. "That's a very reasonable question," Whitmore said, according to an audio recording of the meeting, a portion of which was reviewed by CNN. "That is not the way we did it." But Whitmore assured one staffer that there will be no more layoffs for the foreseeable future, and that he is not aware of any plans for Tronc to sell the Daily News. 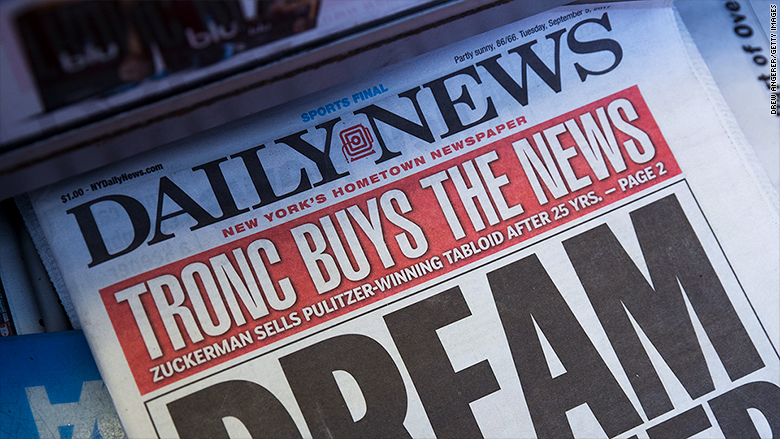 Tronc acquired the paper last September. Multiple Daily News sources told CNN that staff wasn't informed of Tuesday's meeting until a half-hour before it began, meaning that several employees were unable to attend. Those who did attend made for a "deeply skeptical audience," according to the source who was there. A Tronc spokeswoman did not respond to a request for comment. York was most recently the publisher and editor-in-chief of The Morning Call, a Tronc-owned daily newspaper in Allentown, Pennsylvania, where he worked since 2016. Before that, York served for 20 years at the San Diego Union-Tribune, another Tronc newspaper, which the company recently sold to investor Patrick Soon-Shiong along with the Los Angeles Times. He steps in to replace Jim Rich, who appears to have stepped down as Daily News editor-in-chief under acrimonious circumstances. York did not respond to a request for comment. Early Monday morning, hours before the layoffs became official, Rich fired off a cryptic tweet: "If you hate democracy and think local governments should operate unchecked and in the dark, then today is a good day for you." His Twitter bio is just as scathing: "Just a guy sitting at home watching journalism being choked into extinction." Rich did not respond to CNN's multiple request for comment amid Monday's layoffs. An internal document that briefed senior Daily News staffers on how to communicate with employees about the layoffs said that Rich, along with managing editor Kristen Lee, "decided it was the right time to move on to a new challenge." The document, which was obtained by CNN, also indicated that the reductions were driven by Whitmore "in consultation with others at the Daily News and tronc." The Daily News employee who attended Tuesday's meeting said that Whitmore took responsibility for the reductions, but he didn't elaborate when he was pressed on who he consulted before making the decision. Whitmore did not respond to a request for comment.